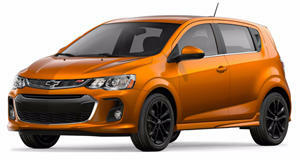 The Chevrolet Sonic is a good option if you’re looking for a new car that will be affordable as well as being filled with all the right bits and pieces to make it an attractive buy for both young and old, but mainly the young. The range starts off at $15,295 for the base version, but it can rise to almost $10,000 more when all the coolest options are added into the mix. The pic of the bunch will be the smaller capacity turbocharged 1.4-liter combined with the 6-speed manual transmission, but the automatic is a perfectly good option too if driving stick isn’t something you like to do. There are good rivals in this segment, but the Sonic is one that needs to be looked at closely if you’re buying in this segment. The Chevrolet Sonic is the automaker’s entry into the sub-compact market and it has to be said that it’s a good offering with ten trim options. It has a good size to it and can be had in a few different configurations that can make the hatchback version look decidedly impressive and imposing, and oddly much better than the sedan version. The base model starts off at a reasonable $15,295 and from there you can add in a decent amount of trim and tech options to make it a head-turning car. You can also rest assured that it’s safe for your kids to use with an excellent crash safety rating from the NHTSA. The interior of the Chevrolet Sonic is good, the available finishes and trims can also take it from a run-of-the-mill, low-key place to a rather stylish and funky place. With the car aimed at the younger generation, it’s been given good space to accommodate the gear for various lifestyle activities, the 60/40 split folding seats free up 47.7 cu. feet of space in the hatchback, which we think will be the most popular choice. The front seats are in a bucket style and offer great support while being comfortable, the cloth option is not bad but the leather option with the embroidered logos is best. In both the hatch and sedan the driver visibility is good, mainly due to the small size of the car, but the positioning of the 6-way power seats helps too. The ergonomics are good, everything is within easy reach, and while driving most operations are available via the controls on the steering wheel. The ride in a car of this size will always be pretty good, it’s a lot easier to give a smaller car stiffer springs and sharper steering response, but the chassis is actually up to the task too being nice and taught – more so in the hatch than the sedan. The ride differs between the two available engines, the small capacity turbocharged options is the quicker one with the sportier feel to it. The 6-speed automatic transmission is good, it’s been perfected over the last few years in various GM models, but for a more rewarding drive the 6-speed manual is the best option. To further improve the chuckability of the car a sport suspension option is available that’s stiffer and 10mm lower. Seating is also good; the power adjustable bucket-style seats will keep you in place when cornering at speed. They also have enough adjustment to get you into a good driving position with good visibility all round. The engines available for the Chevrolet Sonic are not big, but they don’t need to be when you consider the size and weight of the car. 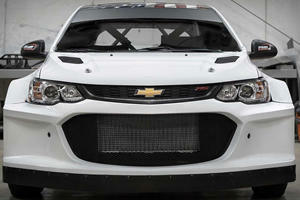 The bigger engine is the 4-cylinder 1.8-liter EcoTec engine that delivers 138 hp and 125 lb-ft of torque. It’s responsive and smooth with both transmission options attached to it. The smaller engine is the turbocharged EcoTec version with a smaller capacity of 1.4-liters, but it makes the same 138 hp but adds in more torque up at 148 lb.ft. This is the better of the two, and it could quite possibly only be due to the feeling of boost, but the extra torque is noticeable with the low overall weight. The auto transmission is good; it’s smooth with precise shift points and doesn’t come across as hunting for the right gear. The manual is sporty in feel with gears slotting into place with purpose. 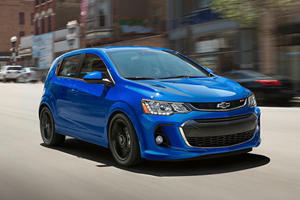 The Chevrolet Sonic is a tech-packed little car. Safety includes Hill Start Assist, StabiliTrack, electronic traction control, ABS, electronic brake force distribution and brake assist along with an array of up to ten airbags. Equipment is good too; it needs to have enough tech to appeal to the young target market and so you’ll find a 6-speaker audio system, USB ports and Bluetooth streaming for Smartphone connectivity, cruise control and keyless entry and opening can be had. The Chevrolet MyLink infotainment system is also there with a good 7-inch diagonal color touch screen taking center stage on the dashboard. The Chevrolet Sonic, both hatchback and sedan, are great options for someone wanting a new, feature-rich car that won’t break the bank. The options and the standard feature combinations will have it appealing to the young and old, and when you tick the right styling options you can end up with a very good looking sub-compact car. Even though many of its siblings aren't so lucky. Reports claim the subcompact has already been discontinued in Canada. This LS swapped rally-spec ‘Super‘ Sonic should be epic.